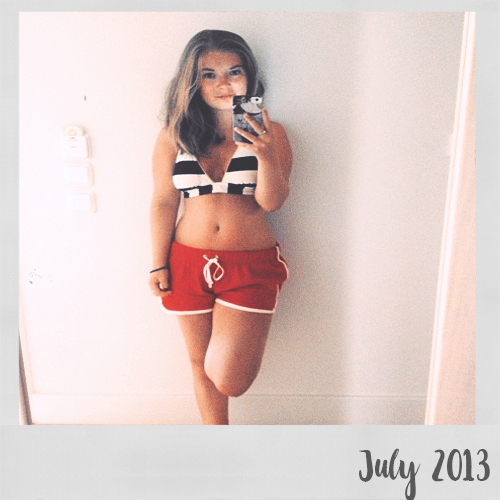 Continuing on my body positivity on my blog, I wanted to do a small blog post in regards to the whole "beach body ready" saga. I find it really annoying when it's coming to Summer, that there's so many adverts and signs that say, "are you beach body ready?" And then there's some diet pills, shake replacement meals or something else. My question is: what the hell is beach body ready? What body shape makes you look ready for the beach? This is where I felt the most positive about my body. And I can tell you now, my body doesn't look like that. My thighs have gotten bigger, so has my backside, and my love handles are more obvious. But myself and Phoebe have been talking. We're going on holiday in August, and with my body positivity, but also insecurities, I've been wondering about the whole, bikini thing. We're going away with my mum, her boyfriend, Thomas (brother), Catherine (sister in law) and the kiddos are all going together, and we're all so, so excited. With so many people going, my anxiety is going sky high, and all I want to do is be at the gym and eating salads. But like Phoebe said, we're all comfortable with each other, so why should I care? I am still going to go to the gym the same amount of times that I usually go. I will still keep eating healthy, and panic when going out for food. I just need to keep my head focused on my healthy lifestyle that I want. Because after all: a healthy mind is a healthy life. Or is it the other way around? The point of this post is that if you're getting down over the adverts and posts about being "beach body ready", then don't worry. Your body is beautiful and stop freaking out about not having the right body for the summer. There's no such thing as having the right body, and you need to learn to accept yourself the way you are.